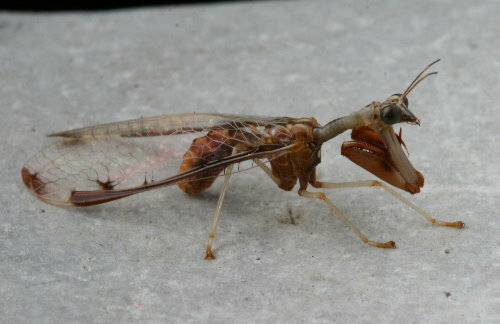 Last summer I discovered a wasp-mimic mantisfly at Maplewood Bog, one of our MAPS stations. I’d never seen one of these strange-looking bugs in person before, but I recognized it from regular browsing of my insect field guide. A few nights ago I encountered another one, only the second I’ve ever seen – interestingly, the same night I got my second-ever Hologram Moth. This individual came to my moth sheet and was just resting there in front of the light. This one’s a different species than last year’s, and in fact a different genus. Last year’s was a wasp mimic of the genus Climaciella. This individual is Dicromantispa interrupta. The second part of the name refers to the dark band that runs along the outer edge of the wing and is interrupted near its tip. As I noted last year, these insects are predatory and use their front legs just like praying mantises do. My Kaufman Guide to Insects makes the note that a sister species, D. sayi may come to lights and prey on other insects that are also attracted to them. This one showed little interest in the other bugs at the light, so far as I could tell. Perhaps it was simply content to sit and people-watch. Nice! I always think of those as more of a southern thing, but if you’re finding them in Ontario I guess I have no excuse for not having seen one yet. I finally found my first mantidfly eggs this spring in Tennessee. Maybe one of these days an adult will pop out of one of my spider egg sacs. What a wonderful looking creature! Excellent photo, btw. Wow, that is an amazing creature. I never knew they existed. Hopefully one will turn up for you, Charley. It’s funny how we can form ideas about range, etc, like that. I’m often surprised to discover how far certain moths or birds range, having thought of them covering a much smaller area. Barbara – The Kaufman is far and away my favourite insect ID guide, though I do know a couple people who aren’t as fond of it. It doesn’t have a lot of information on life histories and such, but the plates are excellent, imho.